Soe believes that through TB Joshua, a third testament of scripture is in production, but this one will be released on DVD. This view is far outside the bounds of anything that can be described as Christianity. It supports our belief that SCOAN is a cult which has more in common with Scientology or the Family International than any Christian church. Can the gift of prophecy produces words equal to scripture? -Scripture is God’s word, and God’s word is true and infallible. -Prophecy is when people speak God’s word, so prophecy is God’s word, and therefore infallible. This belief clearly goes against biblical teaching, and for this reason it would be rejected by all existing forms of Christianity, including charismatic and pentecostal churches who accept the idea of modern day prophets. 1 Thess 5:20-21 tells us that while we are not to despise prophecy, we should test everything, holding onto the good. The words of a self-proclaimed prophet cannot be accepted as God’s words just because he says they are. Read this blog post for a good summary of “what the gift of prophecy is not.” . Is this what other SCOANites believe? Or is Soe a lone fanatic? Another SCOAN supporter, John, has stated that TB Joshua’s words are not equal to scripture. So how do we know that Soe’s beliefs are common among TB Joshua’s followers? Soe is clearly a SCOAN disciple. Although he denies it on one thread, he later admits it when he refers to ex-disciple Giles as a ‘sibling disciple’. An obvious difference between Soe and other SCOANite commenters such as ‘Radicalised’, ‘John’ and ‘Jerry’, is that while the others are very selective in what they write and rarely engage in dialogue, Soe is a talker. He never hesitates to speak his mind or jump into a debate. The deeper within SCOAN you get, the more there is to lose as you will have given up your time, money, your family and loved ones and your very life to supporting it and so it is even harder to acknowledge the truth and deception. At this stage it is very hard to even consider it might be a lie and it is easier to carry on believing…that in itself is lie. -Outer layer: The viewers of Emmanuel TV and people who come to services for prayer. -Second layer: Financial supporters of SCOAN and tithing regular church members. -Final Layer: TB Joshua’s closest circle of advisors. We know from ex-disciple Graham, who spent four years as a disciple, that TB Joshua’s inner circle speak Yoruba, TB Joshua’s tribal language. So the final layer of the SCOAN onion even have their own language that even committed disciples and ‘wise men’ don’t understand. 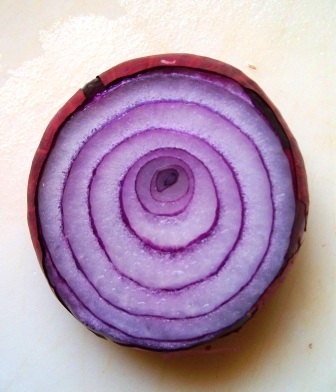 This onion structure is a clear danger sign, designed to hide the truth. We believe that what Soe has said in his comments does represent the teachings of SCOAN, but they are not teachings you would usually be exposed to until you are several layers deep. Those SCOAN supporters who have given a different view may not be in deep enough to have been indoctrinated to the same extent as Soe. Or they may be sensible enough to keep their mouths shut about these extreme beliefs (much like the disciples who advised Giles not to call TB Joshua ‘Daddy’ in front of non-SCOANites). As outsiders we can never know for certain what is said within SCOAN disciple meetings or in TB Joshua’s inner circle. But we’d be interested to hear from you if you are a current or former supporter of SCOAN. Is Soe’s claim just the strange fantasy of a deceived individual? Or is it a widely held belief? Unless his views are clearly and strongly condemned by other disciples, it will be very clear that this is standard SCOAN teaching in the inner layers of the onion. This entry was posted in Teaching, Thinking Biblically and tagged cult, False Christ, false doctrine, false prophet, tb joshua, the gospel of tb joshua. Bookmark the permalink. ← TB Joshua, a false Christ? I have never heard anything like this. To me… Soe really needs to focus on God alone. If you say that someone’s words are equal to God’s words then that would make them your God. I think Gareth should have an answer to this question? I must egree with Jenson. This is example how it is possible to create statement based only on some presumptions not on real facts. Who knows who is Soe ? We do not know her, She can be not a real desciple of TB Joshua. We have no evidence. It is easy to be words players. From where is this converstaion? Visser, the article links to the whole conversation in the second sentence. It is the article ‘Is TB Joshua a false christ?’. If you read it you’ll see that we have not played with words at all. soe claims to have been a member for 14 years, though has also referred to me as a sibling disciple. at another time though she mentioned she was a university student. And based on what someone said… you say it’s a cult? @Visser, @John and myself certainly don’t agree with that either…. why not listen to the majority of people instead of just @Soe ? I don’t agree to many of the things Soe says… but I still believe TBJ is doing God’s work. And based on what someone said… you say it’s a cult? Come on Jenson, you’ve been following this site for a while – you know full well that there are plenty more serious concerns about SCOAN and TB Joshua than what one over zealous follower has said! I appreciate people like you and John distancing yourself from these extreme views, although I still think when taken in combination with other things (all the idolatry, TB Joshua being sinless and infallible, anointing water as a means to salvation etc…) it doesn’t seem much of a stretch to believe that Soe’s words actually represent closely guarded SCOAN teaching. Having followed Soe’s comments for a while, I believe he speaks with considerable experience about SCOAN and TB Joshua. He (he’s a man by the way!) to have once been an office worker for TB Joshua, working closely with him virtually around the clock. See this link for reference. Sure, he could be making it all up – but I don’t think he is. This brings me to the same conclusion as the author above. These are central teachings of SCOAN, but they’re not usually ones the general public are exposed to. Firstly, I would like to unequivocally and whole-heartedly distance myself from the absurd insinuations printed above. Soe is commendably passionate but clearly confused. From my entire experience of SCOAN, TBJ has not once said or suggested anything that even remotely promotes such heretical thinking. In fact, quite contrarily, his teaching simply serves as an incentive to delve deeper into the Scriptures and discover the delightful truths hidden therein. Secondly, the manner in which the writer coins terms such as ‘SCOANite’ is both provoking and erroneous. It is a term he has simply invented in an attempt to create a ‘cultish’ feeling to everything SCOAN related. I am not a ‘SCOANite’ nor a ‘TB Joshua follower’. I am a Christian who greatly appreciates The SCOAN ministry and whose faith has grown immeasurably since discovering it. I agree with John and Jenson here. Alot of scoan supporters (sorry for the term, im not sure what to say?) would have alarm bells ringing at something like that. I would also guess that there are even disciples who would be alarmed at what Soe said. Disciples are sort of divided within SCOAN, into the new people and the old people. The new guys go running around like labrador puppies, all wide eyed and excitable that they are finally living the dream. The Old Timers who have been there years see the new disciples as un-proven, untested disciples (many times I was given tips in ways I could “prove myself to Daddy”). The more you prove yourself, the more you are trusted. Disciples who are more trusted, who have been there longer will eventually start going to meetings with TB Joshua that other newer disciples wont go to. What went on in these meetings always has, and always will be a mystery to me. I have zero idea cos no one would ever tell me. I arrived as a disciple with a few other new guys and we would gather together occasionally over coffee and discuss the “old timers” and trade stories of interesting discussions that had happened. We found out that we were all each being urged to cut ties with families, and to look upon TB Joshua as their father (spiritual father). THe older disciples would say things that troubled us: “This ministry is head and shoulders above the rest”…..”your family cannot help you, if they had, you would not have come to TB Joshua”…..And, when I asked if anyone else out there was also baptised in the Holy Spirit, the answer was “where else do you see these things happening?”. When someone asked if TB Joshua sins, the answer was “Satan does everything in sin”, and then “God does everything in righteousness, no sin, no satan”. Years later when the UK branch disciples were trying to get my gilrfriend at the time to Lagos to get Daddy’s approval for marriage, I mentioned how wierd this was going to be, especially since she was already suspicious that this was a cult. Their answer was “thats cos she has not had a revelation of who the Prophet is”. So in this way, the view is divided. Some are like John, Jenson and Visser (and, once upon a time, me). But then others, who have apparently had this “revelation” would come out with statements like “the Man of God spends more time in the Spirit than on earth”…”TB Joshua taught me how to play the guitar when he was still in the womb” (serious, I actually heard this from someone)…or how “TB Joshua was once reading his Bible and the Bible floated up and entered into his chest and disappeared..he had to buy a new Bible. (TB Joshua has a major scar on his chest, in the heart region. Thats the explanation I got when I asked someone about it). All these kinds of statements and stories I would hear from older disciples just made me think HUH!? I never found out what that revelation was supposed to be, because no one would ever tell me plainly. I am sure that there are other disciples at scoan now who are just like you and I.
John, giles, jenson-you all, i’ve been following your site for quite sometime now and have never commented till this post that talks about my main purpose for continiously viewing your site, the soe you guys think is deluded and confused was my main purpose for continiously reading your articles and the responses following, having read most of her comments on this site, she may be many things, passionate, a talker and all, but if theres one thing she isnt, its deluded or confused, she seems to know exactly what she’s talking about and i’m kind of wondering what it would be like having a follower like her, what she speaks of seems kind of wierd but does make a whole lot of sense when i reason them out, (not the stuff about adding to the bible though) i doubt she said anything like that. that seems to be your how you interpreted it. – i double checked soe’s comments and he also never said anything about adding to the bible, he said the scripture is continuous and one day in future our modern prophets and apostles could get into its books or chapters, I’m a member of Christ embassy by the way and very vividly recall my pastor teaching this in hope that he himself gets into one of the chapters of the book of Acts someday. TB Joshua has never said anything close to this but i don’t think its wrong either unless of course you would have me believe you guys over my pastor. How can we misinterpret an exchange like: “Are you saying the bible is still being written?” Soe: “YES! who said it had stopped?” And then going on to say that TB Joshua’s words will be quoted in the same way Paul’s are today? Soe could not have possibly been clearer. This belief that what TB Joshua says is infallible and unchallengeable goes to the root of ALL Soe’s arguments. Do you believe that TB Joshua’s words are infallible? Your comments made me double check Soe’s comments, just to be sure you’re right and they were misrepresented. I copied and pasted the below. Its taken from the post “Is TB Joshua a false Christ?”, and its the 8th comment from the top. May I ask, who told you that the writing of the bible has stopped? – The bible is Gods Mind & works made known to man in words, – The bible was a collection of scrolls binded together, Are you saying that the voice of God was sealed with the binding of the then available scrolls? are you saying God stopped speaking with the binding of scriptural writings of long ago? This text is often misinterpreted to mean the entire Bible- yet the angel made it clear that he was referring to the book of “REVELATION ALONE”, because at the time John was having this revelation, he was not aware of the secret letters written to Timothy by Paul from prison and other diverse letters..that were later collated with the book of Revelation, or can you tell which came before which? … Oh how I hope you would catch this! Why would Jesus need to send us the holy spirit to teach us if he taught us all we needed to know? If Christ had taught us all things, where did apostle Paul get his controversial epistles from, which we still regard as scripture? And if the Holyspirit would teach us new things from God the father what do you expect those words to become?… Short of scripture? The only thing to be sure of is that what is written now and what would be written would be in perfect harmony with what has been written. Hello John. I wonder if you could comment on the evidence that exists of behaviour and attitudes that are experienced by people who are connected with The SCOAN Ministry that match closely the description of extreme religious organisations (aka Cults). ref the scoanite phrase: fair enough. i didnt mean it in the way you suggested and will try remember not to use that phrase. while we are on the topic of labelling, could i ask what is your opinion of Scoan labelling christians like me “blasphemer”? I think noone is labelling you as a blasphemer. But you are making yourself without any help from outside an accuser by your own words. As you know you will be saved and in oposite not saved by your own words. Your choice is important where you are. Do you think that this mission is for you ? dont believe me? youtube “beware of blasphemers.” its all there. by the way, i appreciate you not using that term. thankyou. Oh my God! i never knew there are people who knew the very truth about every post.and never said anything earlier. i wasn’t so encouraged to continue speaking cos of the sort of interpretations you give to my coments.just as you’ve done to that of soe now.and i believe this is what must have made him withdraw from your site. You’re going to have to help us here Doi. How exactly did the post misrepresent Soe? It quoted him word for word! If you have a problem with what’s quoted, it’s Soe you should bring it up with, not the author. Soe has been round for long enough, I’m sure he wouldn’t hesitate to correct the author if he really felt misrepresented. The thing is, he actually does believe what he wrote! Yes ian he believed what he wrote.but sometimes silence is the answer when people seem not to understand your every post.taking a good look at his writings. he never said Tb Joshua is adding to the bible.so you guys shouldn’t misquote him.and to my experience i believe many atime his point aren’t posted.what should we have him do? Speaking of infallibility. I kind of understand what soe is communicating.TB JOSHUA’S ‘words’ especially in terms of prophecies are indeed acurate and true. Are we talking of Michael jackson’s, Steve jobs, Nigerian matches,etc. What more do we need to convince us about this man? this is hilarious. i mean….really?! I’m sorry Doi, but if anyone’s misrepresenting Soe it’s you. He was quoted verbatim in the article, with links to the source for you to check. I suggest you click on the links and see for yourself. He actually said exactly what you’re claiming he didn’t. You can choose to agree with what he said or disagree, but you can’t pretend he didn’t say it when it’s written in black and white in front of you. Well, maybe soe went too deep about the spiritual aspect of Life.i’m not in the best position to argue on this.